Residual income (RI) is an important part of the financial ability component of the new HECM reverse mortgage financial assessment guidelines implemented in 2014. 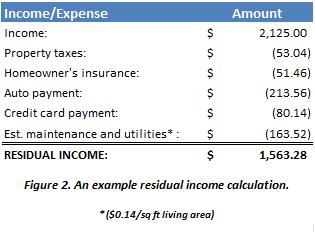 The residual income calculation helps lenders determine if an applicant has adequate income to keep up with property charges as required by the HECM program. If an applicant doesn’t meet the residual income standards, the lender may be required to set up a life expectancy set-aside (LESA) unless the applicant can document compensating factors that make up for the income shortfall. If one or more compensating factors cannot be documented, a LESA may be required or the applicant may not qualify at all (depending on how big the income shortfall is). RI is calculated by adding up all monthly qualifying income and deducting debt payments (excluding mortgage payments to be eliminated by the reverse mortgage), monthly property charges (property taxes, homeowner’s insurance, HOA dues, etc. ), and an estimate of utility and maintenance costs based on the square footage of the home. The leftover residual income must meet a certain threshold based on the region the applicant lives in and the number of people living in the home. Figure 1 shows the standards for various regions and household sizes. To see how this works, let’s take a look at the following example for a hypothetical couple living in Texas. Let’s assume they live in an 1168 square foot home and have $2,125/month in Social Security income. After all the property charges, debt payments, and estimated maintenance and utilities are backed out, the couple is left with $1563.28 in RI. They live in FHA’s South region, so they only need to have at least $886/month in residual income for a family size of two. As you can see from the numbers, they clearly meet the RI requirement in Figure 1. What if RI Comes Up Short? So what happens if the residual income instead came up short because of a lot of debt or low income? It’s still possible to qualify, but the applicant will need to document compensating factors that make up for the higher risk of the residual income shortfall. Such factors can include income from other sources, unused proceeds available in the reverse mortgage after closing, retirement assets, etc. If the residual income is still short after compensating factors are applied, the lender may require the application of a LESA or the applicant may not qualify at all.